June 20th marked the semi-annual reconstitution and rebalance of the Cancer Immunotherapy ETF’s (Nasdaq: CNCR) underlying index. To help educate investors about the ETF’s investment process, we thought it would be helpful to describe this process in more detail and to also introduce you to the three new innovative companies that have been added to the fund. In CNCR’s case, this process happens twice a year: on the third Tuesday of June and December. During this time, two things happen. First, an index committee decides whether any new immunotherapy companies qualify to be added to the index and if any should be subtracted. That part is called the reconstitution. Second, once 30 leaders in immunotherapy are chosen, the index is rebalanced and each holding is given equal weight. CNCR ETF then places trades to replicate these changes as closely as possible. 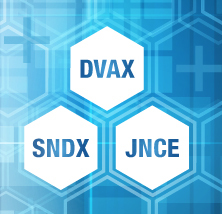 For the June 2017 reconstitution, the committee has added three new immunotherapy companies: Dynavax Technologies (Nasdaq: DVAX), Jounce Therapeutics (Nasdaq: JNCE) and Syndax Pharmaceuticals (Nasdaq: SNDX). As we describe below, these companies are trying to build on what has been learned from already approved immunotherapy treatments and use it to develop the next wave of immunotherapy innovation. The goal is to provide even better outcomes for more patients. The CNCR ETF is thrilled to welcome each of these companies to the fund. Dynavax’s cancer immunotherapy program centers around a cellular component called toll-like receptors that they believe can be stimulated to set off an immune response and kill tumors. The company’s lead drug, SD-101, stimulates the TLR9 toll-like receptor that is inside a type of immune cell called plasmacytoid dendritic cells (PDCs). These PDCs often are found in tumors, and the idea is that by stimulating their TLR9, the cells will then create Interferon-α to attract a host of other immune cells to the area such as cytotoxic T-cells and kill the tumor. Dynavax recently presented data from a clinical trial of SD-101 at the big ASCO cancer conference in June. In this trial, advanced melanoma patients were given a combination of SD-101 and Merck’s checkpoint inhibitor Keytruda. For patients who had never received a checkpoint inhibitor as previous treatment before, 100% (7/7) had some response to the combo. There were two complete responses (a total absence of measureable cancer after treatment) and five partial responses. While this is only a small handful of patients, these numbers are higher than what has traditionally been seen from Keytruda alone so it was cause for optimism among researchers. Of the patients who were previously treated with a checkpoint inhibitor but stopped responding to therapy, 17% (2/12) had a partial response to the combination and 42% (5/12) experienced stable disease. We are eager to follow this program and wish the company well as they treat more patients and additional types of cancer. Drug development takes a long time and for maximum success it is important to thoroughly research and understand the basic science behind any therapies that go into the clinic. It is clear that Jounce Therapeutics was created with this idea in mind when you hear them talk about their translational science platform. Focusing on translational science means they spend a lot of time researching the immune system and tumors in the lab, and understanding the intricacies of the tumor microenvironment before moving drugs into the clinic. Jounce is also a big believer in biomarkers and developing companion diagnostics to their therapies, which might help improve the odds that drugs are being given to patients who are most likely to benefit from them. The first cancer immunotherapy target for Jounce, called ICOS, is a protein found on T-cells that can be stimulated to cause an immune response against cancer. Two famous researchers from the University of Texas MD Anderson Cancer Center, Dr. James Allison and Dr. Padmanee Sharma, originally recognized the importance of this pathway. They saw that ICOS expression positively correlated to better outcomes for patients who were treated for various cancers. Therefore, the idea behind the company’s lead asset (JTX-2011) is to “step on the gas” of this natural mechanism by stimulating ICOS with an antibody. Drs. Allison and Sharma are also founders of the company. Before Jounce was even public, the company made a splash in the news by landing a partnership with the biotech giant Celgene in July of 2016. Celgene received options to jointly develop and commercialize JTX-2011 and up to four other early stage programs. In return, Celgene paid Jounce $225 cash up front, made a $36 million equity investment in the company, and agreed to potential future milestone payments of up to $2.3 billion. We will soon learn if some of the excitement from the deal was warranted. After presenting early data from the first JTX-2001 study at ASCO in June, the company now believes they know which dose to use in an expanded phase of the trial and initial efficacy data is expected late this year. Syndax’s lead drug entinostat is an inhibitor of histone deacetylase, or HDAC. Entinostat was granted Breakthrough Therapy designation by FDA for the treatment of locally recurrent or metastatic estrogen receptor-positive (ER+) breast cancer when added to exemestane in postmenopausal women whose disease has progressed following non-steroidal aromatase inhibitor therapy. FDA generally gives breakthrough designation when it appears a therapy could potentially have meaningful advantages over current drugs on the market. Syndax believes that entinostat inhibits HDAC in immuno-suppressive cells called myeloid-derived suppressor cells and regulatory T cells. By inhibiting the HDAC, the company believes they are reducing the ability of these cells to hold the breaks on the immune system. In addition to being studied in a phase 3 trial for a type of breast cancer, the drug is being tested in combination with various immune checkpoint inhibitors in a variety of tumors such as melanoma, lung, ovarian cancer, and colorectal cancer. Syndax believes that their own unique impact on the immune system through HDAC inhibition might produce synergistic benefits when added to other immune treatments. The most recent clinical data we have seen from the drug came at ASCO in June where they announced data from a cohort of advanced melanoma patients who were previously treated with a checkpoint inhibitor but stopped responding to therapy. 31% (4/13) of these patients had an objective response to a combination of entinostat and Merck’s immunotherapy drug Keytruda. This is a small cohort but is potentially important because these patients who previously stopped responding to checkpoint inhibitors are running out of options. If the entinostat on top of Keytruda is enough to help some respond again, that could be meaningful finding.